Hurricane Mk.IA Tropical For SF1 06 Patch Level Installs. 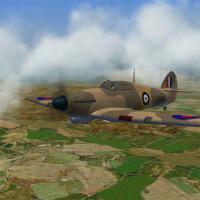 To Install: UnZip and drop the Hurricane_Mk_IA_Trop folder into the Aircraft folder,Sound in the Sound folder. Adding Guns: You need to use the SF1 Gun editor to add guns. You should have the "303CAL_Browning" already. Canopy opens with the 0 key. Dirt: I left the paint mostly cleen. If you want it dirty, Go for it. Pilot Note: The PilotHurricane.lod is too wide for the cockipt. I modded and repainted one that fit for myself that I cannot upload. Note: !!! !A large number of changes were made in the _Data.ini to match the updated LOD's, older versions of the _Data.ini will no longer work correctly.!!!! Updated .lod's With Newest Nose and Fuselage. New version run with up-to-date Fixes. The Seat is now part of the aircraft. Light Fix and some of the Decals Wrench. This Mod is Freewear and not to be sold! Corrected Wing Damage Pivot Points.